Formed in 1955, the San Diego State University College of Business earned accreditation from the AACSB in 1959, and was one of the first business schools in the state to gain this distinction. In 1982, The Charles W. Lamden School of Accountancy earned the same accreditation. Since that time, the college has grown into one of the largest business schools in Southern California. 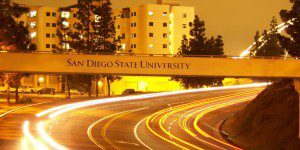 San Diego State University’s campus is near downtown San Diego and just two hours from Los Angeles. Located close to the Pacific Rim and Mexico, San Diego’s business industries include manufacturing, bio-technology, and tourism. The main campus is located only 12 miles away from the San Diego International Airport. As recently reported, The College of Business Administration has 71 tenured or tenure-track faculty as well as 65 lecturers. The scholars have had work included in many publications such as the Journal of International Entrepreneurship, the International Trade Journal, and the Journal of Consumer Affairs. A recent report shows that 590 graduate students enrolled in the College of Business Administration. The Executive MBA and Sports MBA programs enrolled 37 and 22 students, respectively. The recently reported average GPA is 3.42, and the average GMAT score is 607. The typical student is 27-years old with three or more years of work experience. About 54 percent of students are male, while 46 percent are female. The College of Business Administration offers a full-time and part-time Master of Business Administration (MBA), an Executive MBA, and a Sports Business Management MBA.